KVPY Topper Interview with Ashish Asthana: With just two months left for the Kishore Vaigyanik Protsahan Yojana or KVPY 2018, students must be looking for tips to crack the scholarship exam. 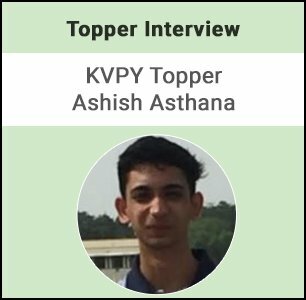 In KVPY topper interview with Ashish Asthana who cleared KVPY in the second attempt, we come to know how essential it is for a student to have one’s concepts clear rather than just mugging up the syllabus. He talks of his preparation strategies and the importance of time management during the exam. Ashish says in this KVPY topper interview that cracking the exam is not a big problem if one is already preparing for JEE or AIIMS. He completed his 12th class from DPS, Greater Noida and apart from clearing KVPY, he has also cleared several other competitive exams such as NTSE, NSEP, NSEC, NSEA, JEE Mains and JEE Advanced. Read on to find out more on how KVPY topper Ashish Asthana prepared for the exam. Q. Tell us something about yourself. Which board have you studied /are studying under? Which school have you studied/are studying in? A. I am Ashish Asthana and I am from Greater Noida. I completed my 12th standard from DPS Greater Noida and secured 96.8% under CBSE. Q. How did you come to know about KVPY? What made you apply for it? A. I got to know about the KVPY Examination through my teachers at school as well as my coaching institute. My deep interest in Physics made me apply for this examination. Q. When did you start your KVPY preparation? Tell us something about your preparation strategy and daily routine for KVPY? A. I gave KVPY in my 11th standard as well but couldn’t clear it, so to make sure I clear it in my 12th standard I started preparing early i.e 4-5 months prior to the examination. KVPY does not require any extra preparations if you are already preparing for JEE Advanced or AIIMS. Although you need to study Biology sincerely if you give KVPY in your 11th standard. Q. How did you manage to study for KVPY exam along with regular classes? What was your daily study schedule like? A. I used to study 8-9 hours on holidays and 5-6 on school days giving almost equal time to Physics, Chemistry and Mathematics. I used to solve previous year KVPY papers in my free time in school so that I could focus on concepts during my self-study time. Q. Did you take any coaching for KVPY preparation? If yes, how fruitful was it? A. FIITJEE Noida helped me clear this KVPY exam. Along with the preparation for the written test, mock interviews were also held in order to help us ace the final round. Q. Which books did you refer for your preparation? A. Books prescribed for JEE are enough to clear the written exam but you need to get an in-depth knowledge of the topic you choose for your interview. Q. Mock tests and sample papers – how extensively did you practise with the help of these? Do you think practising from the previous year papers help and how? A. Previous year papers are the best benchmark for the level of paper as well as the best source from which you can practice. Q. How did you de-stress yourself during the preparation? How often could you pursue them? A. The study time does get stressful sometimes. I used to play football to relax myself whenever I felt overstressed. Q. What do you think is a tough thing to manage during the KVPY exam? A. KVPY tests your conceptual clarity and thus you need to focus on clearing concepts rather than mugging up formulas. Time management plays an important role in every exam and so is the case in KVPY. You need to be quick in solving Chemistry questions as they are relatively easy and give rest of the time according to the difficulty of the questions. Always try to do the easy questions first and then move on to the tough ones. Q. Give us your view of the interview process. How many members were there in the panel? What kind of questions did they ask you? A. The interview round is the final stage of KVPY and is thus a bit tougher than the written stage. A panel of 8-9 teachers are present in the interview room and ask questions on your preferred topic as well as on other topics. I had to fill a form in which I had to my interests and any achievements in science related competitions, etc. Q. Tell us about any other competitive exams that you have cleared. A. I have cleared NTSE, NSEP, NSEC, NSEA, KVPY, JEE Mains and JEE Advanced.